Credited as the most dangerous pirate in the Spanish Mane, Jack Sparrow was once the captain of the infamous ship, the Black Pearl, before he lost it to Captain Barbossa and has spent years since then attempting to reclaim it. 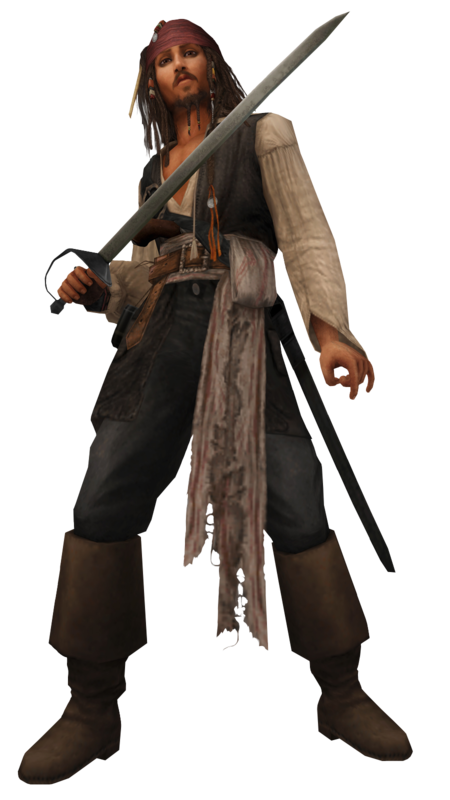 Always one with an eye for opportunity, Jack decides to tag along with Sora, Donald, Goofy and Will Turner on their quest to save Elizabeth Swann, hoping to regain what is rightfully his. Although Jack thrives on the distrust of others, it soon becomes apparent that he has a semi-decent heart and upholds the 'Pirates' Code' despite his self-serving nature. His drunken swagger is merely a ruse to hide his infinite cunning, as demonstrated by his stealing of the Aztec treasure, granting himself invincibility during the final battle against Barbossa. Not long after Jack reclaims the Black Pearl, he is drawn into yet another adventure alongside Sora and his friends when he is roped into saving Will from a Nobody assault on Isla De Muerta. Unwilling to risk his own neck for the well-being of others, Jack decides to ignore the threat of Organization XIII, until he falls victim to that very same threat by being cursed into skeletal form by the Grim Reaper Heartless. Nevertheless, Jack's quick eye allows Sora to gather the scattered pieces of the Aztec gold, thereby lifting the curse and foiling the Organization member, Luxord's, plans. Once the Grim Reaper is defeated and the treasure is hidden in the depths of the sea, Jack is free to sail the Seven Seas once more, this time with a new mission: Gather a bloodthirsty crew and steal Sora's Keyblade for himself. The captain of the Black Pearl. Captain Jack Sparrow accompanied Sora, Donald, and Goofy on a voyage to rescue Elizabeth Swann from Captain Hector Barbossa. They then encountered Luxord from Organization XIII, who was sent to Port Royal to cause chaos and mayhem. 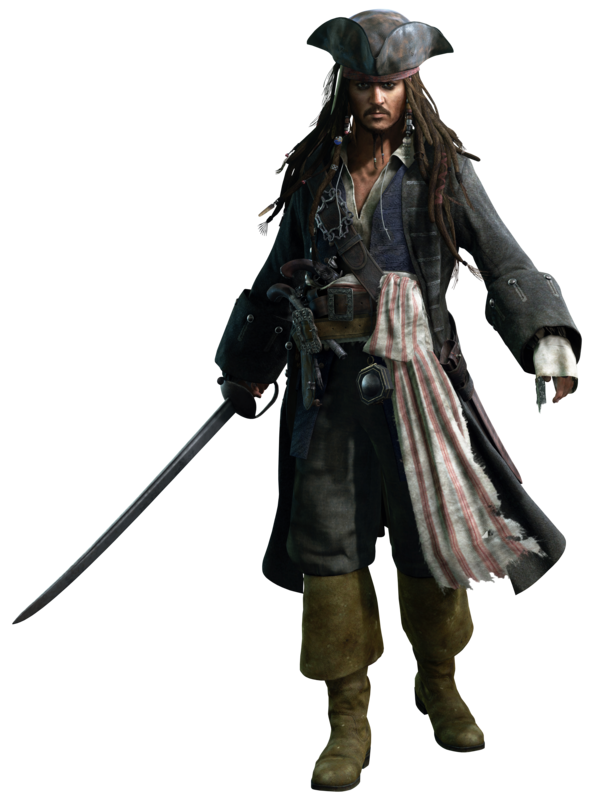 After the Black Pearl was returned to Jack's possession, he was visited by Bootstrap Bill Turner, Will Turner's father. Due to Jack making a deal with Davy Jones where Jones raised the Pearl from the depths, Jack is informed that he must join Davy Jones' crew or else he will be sent to Davy Jones' Locker by the Kraken. Jack escapes to an island inhabited by cannibals. He believes to be their leader but instead they prepare to eat him, however Will turns up on the island and the two of them make a daring escape. They make their way to Tortuga and meet up with Elizabeth and Commodore James Norrington. Desperate for information on Jones' weakness, the crew make their way to the voodoo priestess Tia Dalma, who reveals that Jones' weakness is his heart, and it is locked away in the Dead Man's Chest. They would also need a key in order to get into the chest. Jack sends Will off to find the key, and the rest of the crew set off to locate the chest on Isla Cruces. On the island, a three-way sword fight breaks out between Jack, Will, and Norrington. During the chaos, Norrington escapes with the heart and Jones sends the Kraken after the Black Pearl, which is sent down to Davy Jones' Locker with Jack on board. Will, Elizabeth, Barbossa, Gibbs, and Tia Dalma, along with the crew of the Black Pearl, travel to Davy Jones' locker in order to rescue Jack, Sora, Donald, and Goofy and bring them back to the world of the living. Back in the Caribbean, Luxord makes a reappearance and claims he is a part of Master Xehanort's True Organization XIII. He informs Jack that he is looking for a box, to which Jack isn't pleased to hear.